Tracy Pace ...Floored by the talent in that room! Even more floored how Alyn Darnay was able to pull out what he did from these talents. Like a master magician it was mesmerizing! Thank you!! Tess Labbela...I couldn't wait to get home and write this note to you. I first want to say your class was spectacular with a capital "S". Thank you from the bottom of my heart for giving the gift of YOU today. I enjoyed every moment and learned so much. I was really touch by your warm words and was so blown and thrilled at how you enhanced my, "Meatball Monologue ". I really hope to have the opportunity to work with you in the future. See you soon. Much Love. Talina Adamo...I had such an amazing and wonderfully emotional day with Alyn Darnay at his workshop! I agree with all Laurel said too. The actors present were all so talented and professional! Loved all your performances. Thomas Falborn... Ditto.... he's the best. Always a worthwhile workshop. Thank you Alyn Darnay. Marilyn Carlisle...I have taken his class before and you are right! It's spot on for us actors! Carole Wood...So glad you and many others I love had the chance to experience what I've already gotten to from one of my best friends, Alyn Darnay. Robynn Fredericks...Totally agree, Laurel! Such a fabulous class and great insight from a true actor's director! Thank you so much, Alyn Darnay! I'm looking forward to the next and digging even deeper! Debbie Baker Robinson... Alyn is very good at his craft. Karen Aruj ...It was so excellent to be in the presence and work of so many good actors. You were wonderful! I'm looking forward to more classes and an exciting upcoming project! Phyllis Brown...Thank you for yesterday. I learned more about myself from your insightful direction in both scene work and monologue which will help me to audition more honestly. It's never too late and you're never too old to learn more about yourself. - feeling inspired. Alyn Darnay. Thank you so much, today was such a growing experience. Gabrielle Antoinette ...Love it! This workshop was awesome! We really worked those chops! Best actors! Love you guys ! Mary Farah ...Thanks Alyn Darnay for such an extraordinary class. I learned so much. I love you all so much. Some I know, some I just met. You are my family regardless. Acting is a gift. Acting is my passion! 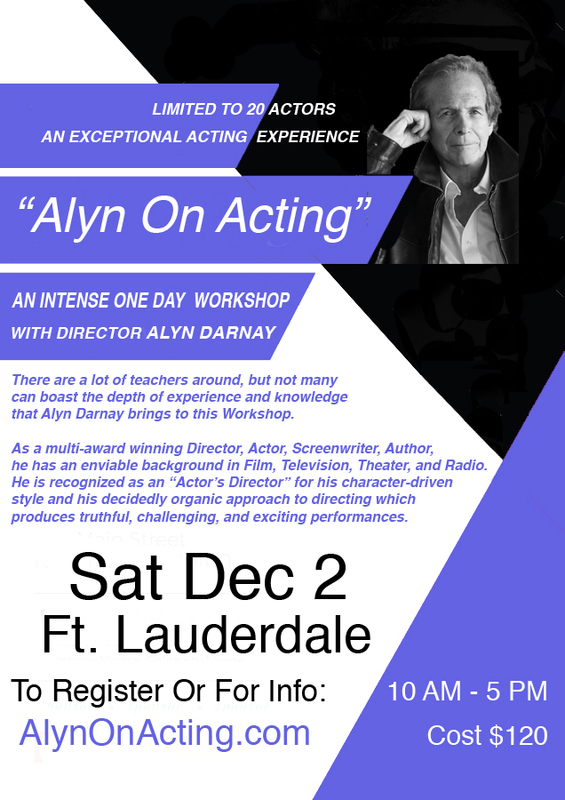 Yesterday, I attended an extraordinary workshop by Alyn Darnay and it was amazing in every way! Alyn Darnay took the time with each and every talented individual in that room and help us dig deep into our character, whether it was in a monologue or and a scene. He guided us into truly understanding our purpose in the character. I appreciated that and the whole workshop! Get comfortable into being uncomfortable and let go! Thank you Alyn Darnay. Some I knew in this workshop, others I just met, to me we are all family! Thank you! Keep shining! Lets keep reaching for the stars. Burton Gazzara... Thank you Alyn Darnay for this extraordinary acting workshop. You shared many pearls of wisdom. I learned a lot. I teach a method of acting I've developed through my many years of working with actors in my capacity as director, actor and screenwriter. It blends my own training, award-winning experience, and understanding of today's style of acting preparation and performance with elements from the standard methods of Stanislavski, Strasberg, Hagen, Meissner, and Adler. This method breaks down the psychology of acting study, practice, and style into an easily executable methodology aimed at fostering believable performance from any individual actor. My desire to create inspired actors is aimed at improving their innate abilities and performance, my method of acting develops unique techniques within the individual actor that allows him/her to reach their full potential and discover a new world of deeply compelling sensory acting ability. 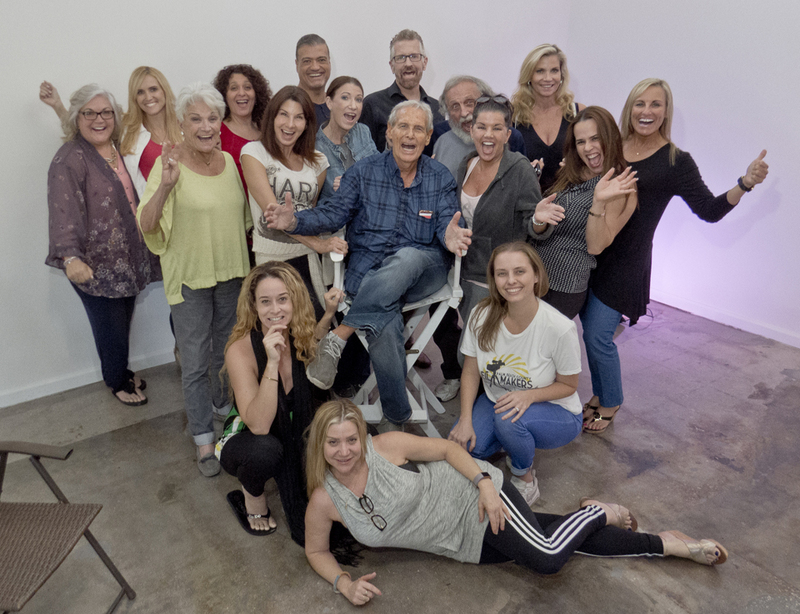 As you might imagine, the intense daylong Workshop is a hands -on acting workout, not a lecture and covers several distinct techniques. The Workshop is limited in number to allow a more intimate one-on-one opportunity to absorb the method while providing a safe environment in which to interface and work with the other actors learning along side of you as you identify personal strengths and overcome your weaknesses. I believe that every actor must be able to create an intense emotional reality and a vibrant imaginary world to inhabit while acting. This is not an easy task, nor does it generally come naturally. It takes practice, training and exercise to bring it into clear focus. Here's your opportunity to learn how to dissect a character with razor sharp precision, and then utilize that knowledge to reach a level of creative performance that you never imagined you could ever attain. Don't just be a good actor; master the knowledge to become a great one, this workshop is designed to help you accomplish that...at every level.